It’s your time to make a difference! E-Comm is a recognized leader in emergency communications. We are a place where you can assist the public and first responders when they are in the midst of crisis and provide them with the support they need. We are a team of more than 600 people unified by our passion for public service. We have created a collaborative and healthy work environment and are looking for people to join our team who share that passion and seek a challenge. 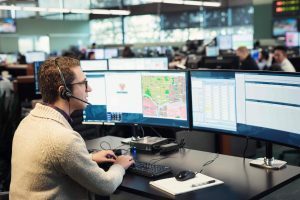 Career growth opportunities include: police and fire call-taking, police and fire dispatch, technology services, corporate communications, agency liaising, training, staffing and management. As we continue to grow as an organization, we remain focused on our values. Committed to being courteous, professional, fair, and non-judgemental in all our workplace relationships. Accept ownership of our actions and behaviours and the outcomes they produce. Conduct ourselves in a manner that is ethical, reliable, honest, and trustworthy. Solution-focused when confronted by challenges – being innovative whenever possible. Achieve success by working together in an atmosphere of open communication, where information is shared and involvement is encouraged.